I restored this 1946 Harley Davidson EL 1000 Knucklehead in 1994. Since then it has been running with no problems. Now it's enjoying the life of Provence in France, where it can be used all year. This bike, I feel good because it is I who have rehablitert engine. It runs like a clock, and is comfortable to drive. My father has from the beginning byggd it up from scratch with a little help from me on the engine. 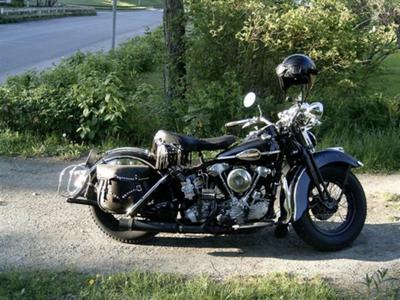 This is a very ultra Knucklehead and is very original. Good luck with the run down in the Provance / France. Soon we two Knucklehead you down in Provance running in the heat, Brom Brom says your son! !